If there was an award for friendliest place on the Net… well, I guess SOMEONE would win it, but I’m reasonably sure I’d vote for The Drunken Severed Head. This week, Max Cheney celebrates his first anniversary as a blogger, a stupendous achievement in dedication, endurance, and silliness. Clicking through The Drunken Severed Head is like visiting with a old friend, just sitting around having a beer, talking about monster movies, having a few laughs, and knowing that if you nod off on the sofa, Max will surely stick your hand in a bucket of warm water. 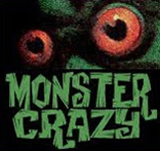 If I had to be highbrow about it, I’d say that Max Cheney’s blog is a celebration of monster-related pop culture ephemera, but that fails to convey the sheer fun of Max’ discoveries. Max takes you on neighborhood car rides, checking for over the top Halloween decorations, or out to the burbs to play a game of DayGlo Monster Mini-Golf. He takes you along to old amusement parks, monster memorabilia conventions, zombie walks, and he introduces you to his talented friends, of which he has far too many. What I like most about The Drunken Severed Head is how honest, heartfelt and obviously unhinged it is. The blog is relaxed, it feels unplanned, and there’s a real cheerfulness there. Check out one of Max’ typical posts, this one about Frankenstein masks and toys. See what I mean? Max is having a ball, and it’s infectious. Max Cheney, it must be said, is a respected and beloved member of the Monster Kid community, posting reliably and knowledgeably on the Classic Horror Film Board and serving as a moderator on the Universal Monster Army Message Board. When I started Frankensteinia last August, Max was one of the very first people to communicate with me and show his support for my efforts. 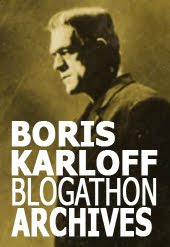 Thank you for your frienship, Max, my certifiable friend, and Happy Blogging Anniversary! And here’s an extra special salute to Max’ much, much better half, Jane The Voodoo Queen, for everything she does, especially making sure that Max takes his medication. graphic on the menu at right, and cast your vote... for ME, Frankensteinia! 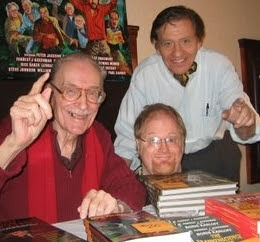 Pictures: Max Cheney’s Drunken Severed Head with legendary Famous Monsters editor Forry Ackerman and cover artist extraordinaire Basil Gogos. As for the other picture, sorry, I don’t know what the hell is going on there. Moi es completement debile! Où est-ce qu'on loue des chameaux? Il y a un cadavre sur le lit. S'il vous plaît, faites changer les draps! Garçon, il y a une mouche dans le potage! Je suis peut-être saoul, mais demain matin je serai décuité, et tu seras toujours aussi hideux! No, no, vous êtes très jolie, pour une étrangère. Je t'aime. Embrasse-moi, mon chou! Vous connaissez celle du Belge qui a téléphoné à l'agence de voyages et a dit, "Je voudrais savoir combien de temps il faut pour voler d'ici à New-York," et la réceptionniste a répondu, "Juste un moment," et le Belge a dit, "Merci bien, au revoir" ? Okay-- seriously: Merci, mon ami. Oh how bitterly, bitterly, I regret ever telling you that I spoke French!